FDD's Tanya Gilly will be on C-SPAN Sunday morning from 7:45 - 8:30am EST to discuss the Iraqi constitution and take viewers' calls. After I posted my quick, at-a-glance analysis of the draft Iraqi Constitution Wednesday night, I spent most of yesterday exchanging e-mails and calls with Iraqi activists and experts on constitutional law. Robert Blitt from the US Commission on International Religious Freedom was particularly helpful, sharing with me the enclosed analysis of the August 3rd version. The good news is that we've come a long ways since that draft! The bad news is that the clerics still managed to sneak in a too many loopholes in the constitution that could be used to hijack democracy and impose an Islamic theocracy. For more on this see the Policy Briefing on FDD's website. It was a relief for many Iraqi women and democracy activists when Thursday's deadline for Iraq's national assembly to vote on the draft constitution came and went. As the deadline loomed, many Iraqis frenetically rang the alarm bell about major loopholes in the constitution that open the door for Islamic law in Iraq. The delay buys a little time to work to close these loopholes — but it won't happen without U.S. support. Read More. "The Federal Supreme court that is made of Judges, Lawyers and Sharia Experts will have the final judgment in making the law ( any bill must be approved by these individuals prior to becoming a law). Laws while in effect must be approved by this body of Sharia Experts. And finally, any interpretations of any provisions of the constitution will be settled by the same individuals. Basically, 137 went out the front door and came back in a very sneaky and conniving way through the back door." She is correct the proposed draft calls for the court to approve laws before they go into effect (article 91) , as opposed to resolving constitutional disputes - I think she's right, this does grant the court too much power. Not to mention it being completely impractical - imagine if the Supreme Court reviewed every law passed by Congress! Other women activists, such as Maysoon Damluji, President of the Iraqi Independent Women's Group and the Deputy Minister of Culture in 2004, and Dr. Raja Kuzai, a member of the National Assembly (she was also one of three female members of the Iraqi Governing Council under the CPA), have been very vocal in denouncing the constitution. They argue that the clause calling for Shari'a experts on the Federal Court could negate all the other clauses in the constitution that aim to protect religious freedom and the basic rights of women. Maysoon wrote in an e-mail to women groups: "After much insistence, some of us managed to meet with some high officials yesterday, in order to express our deep dismay with the draft of the constitution. Clergymen will veto any attempt to intoduce modern values to this nation... . We told them that there was nothing in the constitution that would prevent a 12 year old girl from forced marriage of a 60 year old tribal sheikh or religous sayed." Other women leaders such as Safia al-Souhail and Zakia Hakki tell us in their e-mails and calls that they feel the lobbying by women's groups has been effective in blocking most of the religious parties' attempts to write an Islamic constitution. 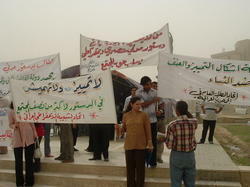 They say that the language on democratic principles and essential freedoms, the reference to the Universal Declaration of Human Rights, the 25% quota for women, and the bi-cameral structure with elected representative give women (and other Iraqis) grounds to push back in the future if clerics try to impose Islamic law. I say to the Iraqi women, and all Iraqis who want to ensure Iraq is not ruled by clerics: Keep pushing back! Every time women, minorities and non-Muslims in Iraq speak up and are vocal, they remind the political parties and their fellow citizens that the new Iraq must accomodate them as well. And the line is pushed closer to liberal democracy and away from theocracy. The debate has begun - and it is an important one. The process will not end with the Assembly vote: if the constitution is approved, the Iraqi newspapers, radio, television and civil society will now take over and engage Iraqi society in a debate about the constitution. Does the constitution contain sufficient mechanisms for Iraqis to protect themselves from clerics who would try to impose Islamic rule? Iraqi women's groups and democracy activists are ready to spread the word inside Iraq. ELEANA GORDON: Iraq's Proposed Constitution is not Perfect, but it's no Islamic Republic. The Associated Press has translated the complete text of the Proposed Iraqi Constitution that was presented to the National Assembly late on Monday, August 22 and will be put to vote this week. A quick glance reveals much that is good - in fact, revolutionary in the Middle East. There are some clauses and wording that give cause for concern, but overall the constitution has very strong protections for popular sovereignty and individual freedoms and is not establishing the Islamic Republic that we feared. Click here for a more detailed analysis, with links to the text of the constitution. The highlights are below. The Constitution balances Islam with Democracy, and guarantees the political and religious freedoms of individuals (not just groups). Freedom of belief is repeatedly mentioned in various articles of the constitution, and the State is explicitly forbidden from imprisoning anyone for their religious or political beliefs – a protection that would be welcome in most countries in the Middle East today. Popular sovereignty is also enshrined, and ultimate authority resides with the people. There is room in the constitution for women’s rights to be curtailed in the name of Islam in the future, but the barriers are higher than in most Arab countries, and women are guaranteed a political voice with a 25% quota. They have even gained some important new rights, like the right to pass on their citizenship to their children. For now it seems that the civil family law of 1959 remains in place, as there is no mention of family law being subject to religious courts. A number of key freedoms can be restricted by law in the name of “public order and morality” such as Freedom of expression, freedom of the media and freedom of association and peaceful protest. Even if this does not seem to apply to the right to form a political party, it seems that a party could be restricted it its ability to express itself and to organize. The make-up of the court that will judge the constitutionality of laws is still to be resolved by parliament. It is to include “judges and experts in Shar’ia and law.” It does not specify whether the Shar’ia experts must be clerics (the parliament might decide that), nor what the balance will be between Shari’a experts and judges would be. But the court would be appointed by elected representatives, making it accountable to the people. CORRECTION (8/25): 1) It appears that the Arabic version does mention that family law would automatically revert to religious courts, but Iraqis will have the right to opt out of religious courts and civil law will also remain in place. 2) The 25% quota for women is in the "Interim" section of the constitution, its status is still unclear. The Iraqi National Assembly voted unanimously to extend the deadline for Iraq’s new constitution until August 22. President Jalal Talabani formally requested the extension. There are still several unresolved issues: among those, the role of Islam in the constitution. Sources tell us that there has been some progress on equality under the law for women. One quarter of the National Assembly and other positions of power will be set aside for women. But women’s groups will be keeping the pressure on to ensure Shari’a isn’t the sole source for law. For more about FDD’s efforts on this, please click here and here. The heavy sand storm in Baghdad earlier this week may have kept Iraqi political leaders from gathering to discuss the constitution, but it did not stop Iraqi women from holding a demonstration in Fardous square in Baghdad. Mohammed at Iraq the Model shares pictures of the demonstration, and relates conversations with Islamist women who held a small counter demonstration: "No to immorality and dissolution" they called, illustrating the way Islamists play into the fears of a conservative society by equality women's rights with sexual promiscuity. "We want a civil law to govern issues like marriage and inheritance and we also want to reactivate the related international treaties that Iraq had already signed and approved long time ago and even the existing civil law that we support needs to be modified and improved in a way that matches the needs and rights of Iraqi women and we insist that Islam must not be the only source of legislation". So far, the women of Iraq - and their male supporters - have been the most active and forceful voice pushing back on Islamist attempts to turn Iraq into an Islamic state. Their struggle is about a lot more than merely granting women the same rights as men: it's about freedom of religion, freedom of belief, freedom of conscience, and whether the new Iraq will be a step forward or a step backward in the Middle East. ELEANA GORDON: What do Iraqi Women Want? We had a packed house at the National Press Club yesterday for our forum on women’s rights in the new Iraqi constitution. Zainab al-Suwaij and Basma Fakri explained what’s at stake over the next 10 days and why Iraqi women don’t want to be subjected to Islamic law. Read the front page Washington Times story here. View the event on C-SPAN here. Read a follow up press release on the event here. Yesterday we noted that a group of prominent Iraqi women held a press conference in Baghdad to present a number of demands for the new Constitution. Their six demands are listed below, and the full press release is enclosed. Islamic Sharia should be one of the sources of law. Iraq should abide by all international treaties and agreements that guarantee human rights, women’s rights, the rights of children, and the rights of those with special needs, and consider these treaties and agreements as one of the sources of law. Female representation in the three branches of government and in other decision-making positions should not be less than 25% and this provision should not have a time limitation. All Iraqi citizens (men and women) must have equal rights in the law and before the law, without any discrimination for any reason. The constitution should not include any text that is conducive to national, social, ethnic, gender, and/or religious fanaticism. The constitution should ban all kinds of violence against women. The drafting of Iraq's new constitution has been taking place mainly behind closed doors, and it was only in the last few weeks that Iraqis had a glimpse into the process when unofficial drafts were leaked to the media. What they saw alarmed pro-democracy Iraqis, especially women: language designating Iraq as an Islamic Republic, a clause granting clerics a special status in society as "religious and patriotic symbols," and a statement that Islam shall constituted "the basic source for legislation," rather than "a" source, opening the way for the rights of women and non-Muslim minorities to be curtailed in the name of religion. For more detail on the current drafts in circulation, see Kurdistan News.
" It was the first opportunity for us as representing active part of the civil society organizations to meet with the sub-drafting committee. We've expressed our worry about very short time behind the drafting committee to accomplish its work in a close doors. We're still demanding for prolonging the dead line of writing the constitution in order to get the chance for Iraqi people to be involved actively in this very serious process". Today, in Baghdad, a group of 16 prominent Iraqi women activists launched a campaign for strong protections for women's rights in the new Constitution, under the banner "More than One Source." They held a press conference in Baghdad where they listed their demands for the new constitution - see today's article in the Mail & Guardian, and photographs at yahoo. The campaign includes three of the founding members of the Women for a Free Iraq campaign, Rend el-Rahim, who served as Iraq's Representative to the United States in 2004; Safia al-Souhail, Iraq's Ambassador to Egypt (who also spoke at the State of the Union Address); and Zainab al- Suwaij, Executive Director of the American Islamic Congress; other campaign participants include Azhar Al Sheikli, Iraq's Minister of Women's Affairs, and Maysoon al-Damluji, Deputy Mister of Culture. FDD has always believed that Iraqi women are a key to democracy in Iraq- they have the most to lose, and the most to gain, in Iraq's democratic process. FDD's Democracy Programs will seek to publicize the ongoing efforts of these brave women to fight back against the attempts by religious conservatives, backed by Iran, to ignore Iraq's religious and ethnic diversity and curtail the rights of Iraqi citizens.